Oil hovered near a three-year high of $70 a barrel yesterday on signs that production cuts by Opec and Russia are tightening supplies, but analysts warned of "red flags" due to surging US production. International benchmark Brent crude futures were trading 3 cents lower at $69.84 by mid-afternoon, having risen above $70 earlier in the session. 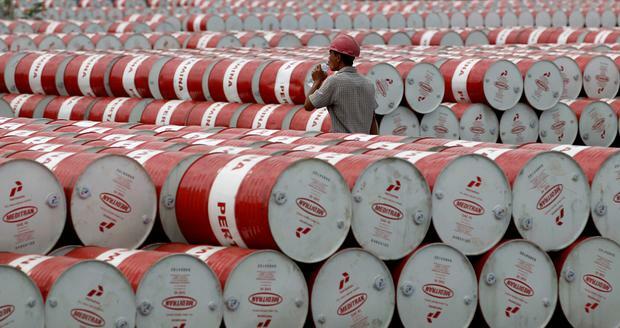 US West Texas Intermediate crude futures were up 22 cents at $64.52 a barrel. Trading was relatively slow due to a national holiday in the United States. A production-cutting pact between Opec, Russia and other producers has given a strong tailwind to oil prices, with both benchmarks last week hitting levels not seen since December 2014. Growing signs of a tightening market after a three-year rout have bolstered confidence among traders and analysts that prices can be sustained near current levels. Bank of America Merrill Lynch yesterday raised its 2018 Brent price forecast to $64 a barrel from $56, forecasting a deficit of 430,000 barrels per day (bpd) in oil production compared to demand this year. Other factors, including political risk, have also supported crude.